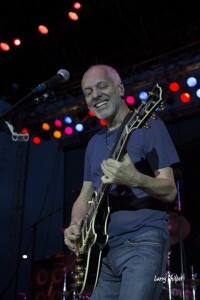 Home > Articles > Backstory Peter Frampton: Frampton Comes Alive! In 1976 two important cultural events happened in America: the country celebrated its bicentenary and Frampton Comes Alive! was released. The album captured the era of stadium rock and FM radio’s emerging album-­oriented rock format like no other medium. The joke, from Wayne’s World II, that the album was issued at birth to every American kid in the suburbs during the 70s might be closer to truth than not. Frampton Comes Alive! hit number one on April 10th, 1976 and spent 10 (non-consecutive) weeks there. The album remained on the charts for almost two years. It was more than just a successful album, it was a phenomenon in the music business. Frampton Comes Alive! sold over 16 million copies, and is considered the best selling live album ever. Before going solo, Peter Frampton was in the hard-rock band, Humble Pie, and Frampton’s Camel. His first three solo albums had failed to crack the top 100 and he was doubting his decision to leave Humble Pie when he started the Frampton Comes Alive! tour. Hopes for the live album — recorded in 1975 — were cautiously optimistic. Half of Frampton Comes Alive! was recorded at Winterland in San Francisco and the other half months later. The earliest version of the album was slated as a single and didn’t include “Show Me the Way” or the ballad, “Baby I Love Your Way” – two of the biggest hits from the final product and songs Frampton’s growing fan base screamed for every night. Jerry Moss – the “M” in A&M Records – had signed Frampton to the label when he was 19, because, Moss says, “He had a cool face, he didn’t mind working, and he had a great attitude.” He adds, “I thought he was a star.” Moss flew to New York for the mixing sessions and was shocked to find “Show Me The Way” and “Baby I Love Your Way” missing. Moss gave the order for a double album and the go ahead to record a half dozen more shows. Frampton went back on tour and the live album was ready for release by January, 1976. Frampton Comes Alive! leapt to No. 51 its second week, then to No. 22, No. 6, No. 4 and No. 2, where it loitered throughout March. Frampton got a call from Dee Anthony, his manager since his Humble Pie days telling him, “We’re No. 1.” In April, 1976. “Show Me The Way” is Frampton’s biggest hit. The studio version was released as a single in 1975, but fell flat. The live version of “Show Me the Way” was recorded at the Island Music Center in Commack, Long Island. Frampton’s East Coast Crowds were legendary and the crowd participation adds to the charm and appeal of this live album. “Baby I Love Your Way” was captured while playing a show at the State University of New York. It peaked at #12 (for 2 weeks in August) and spent 16 weeks on the Top 100. Frampton used a device called The Talkbox to create the unique sound on this album and introduced the squawking guitar effect, to millions. The one Frampton used, was made by a company called Heil. The sound traveled up the clear rubber tube and was attached directly to the microphone which was generally plugged into the main PA system. In the 1994 classic, Reality Bites, Ben Stiller tells Winona Ryder that this album “totally changed my life.” Frampton benefitted from a specific cultural movement of the era. He slipped in at the dawn of the disco and punk movements; both genres would reshape the music business and have a crushing effect on his career. Frampton found fast, fleeting, and fickle success, but he’s still performing and perfecting his craft today. His album sales exceed many newer and established artists performing now. This album is a sweet soundtrack for those innocent days before Trickle Down Economics and we highly recommend catching Peter Frampton anywhere, anytime.